This week I will be posting work realized during my long blogging hiatus. 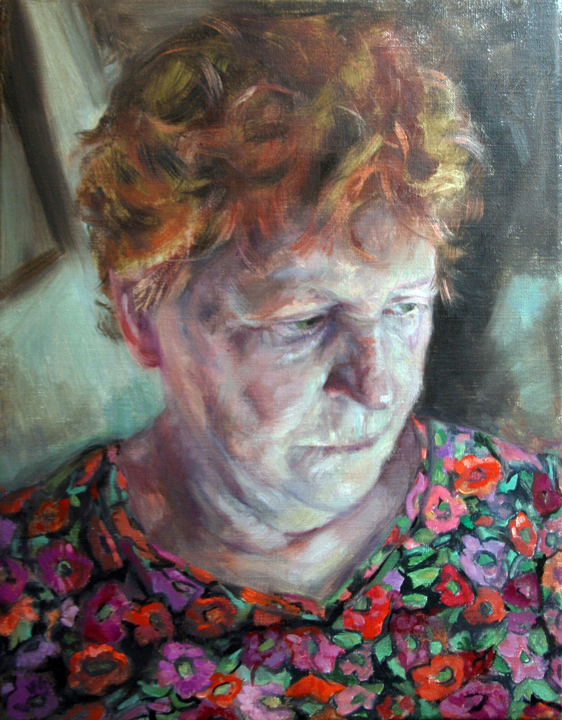 This is the first of several portraits of red heads. I love colors found in the skin tones and hair highlights of red heads. Your hiatus was worth the wait, for me. I see my mother here, as she was some time ago. Thank you! Thanks ever so much, Marina! Her eyes seem to gaze into the far horizon as if she were lost in the mists of time. So interesting… are you related to her? In the past I have often commented on the life and expression you convey in your sitter’s eyes. Now you have drawn my attention to the hair – so many shades, tones and textures. Thanks so much for you lovely comment, Louis. Good work , Elena! I was thinking you lost all of your brushes or your paint dried out 😉 Good to see you back! Another masterpiece from a magic palette. analysing for hours later and dreaming to try someday. with my poor learning skills and limiting medium. I look forward to this whole series! Redheads do have that wonderfully luminous skin don’t they – beautifully captured here Elena. They do. Thank you, Anna. Glad you are back. Amazing, love the light reflection and the shadows. Love the tonalaties used for the face, it always amazes me how you use different colors to create depth in your portraits. Amazing work! Wow, gorgeous face and hair! And I really love the vibrant flowered top! The reality here is almost unreal. You’ve caught the colours perfectly, Elena. Wonderful! Looking forward to seeing more! Wonderful, Elena! I agree about skin tones. Glad to see you back. This is so nice. So expressive. Have missed seeing your work! Such depth of character you have captured in this portrait Elena. Wonderful work!